It’s a bird, it’s a plane, it’s a… hit? 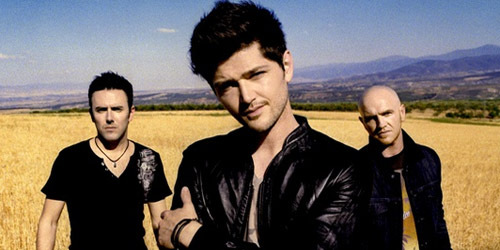 The trio of Danny O’Donoghue, Glen Power and Mark Sheehan, better known as The Script, are writing a new passage in the text they call their career. This September, they’ll be out with their fourth album, No Sound Without Silence. Yet, the talk is out there about some of the changes regarding this era. No longer is the group with Epic Records in the U.S.; they’ve made the jump to Columbia Records, a giant step in the right direction. Both are divisions of Sony Music; however, you might recall that the promotion of their third set with Epic, #3, was halted in the midst of a layoff, leaving second Stateside single “If You Could See Me Now” abandoned at Hot AC radio with only a handful of stations of it. Given Columbia’s big successes as of late, I’m sure the boys will be more of a priority to the label, especially with a strong leadoff single. This leads to the focal point of the chorus, a reminder that one’s rough beginning can become determination and strength as a leader later in life. The section begins, “When you’ve been fighting for it all your life/You’ve been struggling to make things right/That’s how a superhero learns to fly,” with O’Donoghue chanting along that “every day, every hour”, one can “turn the pain into power.” Of course, it comes off as really inspiring, much to the same degree that the “Hall” encouraged listeners to do their best because one day, they would be recognized for all the work that they fostered. With many people finding themselves in the same position, there’s doubt that this song will click on a relatable level. This is further exemplified in the middle eight, which leads back to the couple described in the initial verses of the song. It starts, “She’s got a lion in her heart/A fire in her soul,” compared to the “beast in his belly/That’s so hard to control.” The passion is there, and a request is made to “light a match, stand back/Watch ’em explode.” The two are finally free to let go of their reservations and be the people they want to be. They’ve learned that the dream is inside them, even when it felt as though nothing would change. It’s got a great lyric and is pleasant melodically, so I will definitely be rooting for it as it soars into the stratosphere we call the radio airwaves. Realistically, I’m hoping for a return to the top ten at Hot AC radio and somewhere around/just below the top 20 at CHR, unless kryptonite strikes it earlier than I’m anticipating it could. With four #1’s to date on my personal top 40, this should be in contention for their fifth this fall. Get your capes on, kids: the flight is about to begin. A Bridge worth traveling on. 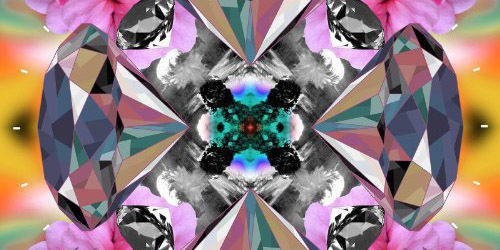 Five years ago, Jamie Scott and Tommy Danvers began working together on a piece that would eventually hit the top of my personal chart during the summer of 2012: “Stare Into The Sun”. It spent three weeks in that position. However, it was that duo’s first big single, “Free”, that gave Graffiti6 the top song of my calendar year 2012. It’s a classic in my books. Though their airplay and album sales have unfortunately been limited in the States, they’ve managed to keep going through touring and the subsequent recording of this followup album. At the top of my list is the percussive-driven title track, “The Bridge”, an edgy pop composition with a shade of a Bollywood touch. It’s by far the most instant song on here and would have given them a killer reintroduction to the U.S. charts if it was the leadoff single from the set. Against the pounding and thumping away is a more tender lyric about a man yearning for his lover in a state that isn’t so lucid. Scott questions, “Where’s the bridge we built that takes me home?/’Cause nothing means nothing at all without your love.” The powerful combination of the two delivers not only an excellent track, but somewhat of a bond between The Bridge and debut album Colours, a futuristic fusion to their psychadelic past. Just as amazing is track six, “Under The Mask”, looping a light-hearted piano melody through a pure pop sound. This could easily be adapted into a dance record, but in its original form, it packs enough of a punch to standout as a solid radio worthy song. Its uplifting message and bright chorus only further its status as an anthem for the insecure and down: “There is a light in your heart/There is a light burning a fire in the dark/Under the mask, we’re beautiful/So let out the light, no need to hide anymore.” It’s really a lovely tune in all the aspects of it. Of course, the adult contemporary fare in the bunch shines in a similar manner, most notably on the fourth track “Settle For Your Love”. As the title suggests, the song is about a second-rate romance, but one that’s passionate and fulfilling enough to satisfy the protagonist. He states, “When I feel lost, down and confused/Darling, you hold me, and the wires are removed.” Built on a more relaxing base, the song picks up in intensity towards the ending, when an almost Celtic-themed arrangement and marching band patterned drum line turn a straight-forward song into a more traditional tune. Also in that soft rock realm is “Angels and Devils” in the seventh position on the tracklisting. Once again, the piano takes the lead on this one, as well as the gospel-tinged flavor found on fifth track “Washed My Sins”. (You may remember that a video was posted for that song last year featuring a mix of stock footage from different eras.) This, however, strikes a nice balance between the ethereal vocal stylings and the more earthy guitar solos and percussion. That rocky edge and progressive pace, though not the focal point of the song, do set it apart and make it quite successful. Verdict: the wait was definitely worth it. Label politics aside, The Bridge is absolutely one of the best albums of 2014, but as an independent release, it will ultimately fly under the radar without the enormous notice that it really deserves. I may fan boy for these two and Scott’s budding career as a songwriter for other acts I enjoy, but the talent they possess and the tracks they produce can do no wrong in my eyes (and ears too.) I’ll forever be frustrated with Capitol from dropping the ball on it, but I can’t be too angry now that it’s out, right? It’s a real gem. The Colours may have melted together the last time around, but the hues of their latest hits are as simple as black and white. The last few years have been a crazy ride for 23-year-old singer/songwriter Ed Sheeran. After signing with Atlantic in 2011 following a series of EP releases, he soared onto the British charts that summer with “The A Team”, which debuted and peaked at #3. Parent album + (“plus”) did even better, securing a #1 debut in September in the United Kingdom. It’s one of the rare debut efforts to go six singles deep in that country, all of which went top 40 and sent album sales up to 6x Platinum status, or 1.8 million units. A similar story happened around the globe in the next few months. In the U.S., Sheeran’s rise was more drawn out. “Team”, sent to AAA radio in February 2012 and Hot AC in March, rose to #3 at the former in July, but slowly crept up to #5 at the latter (and #9 CHR) in January 2013. The extra time paid off: the single sold 2 million copies during its U.S. run, + went Gold and he, himself, has garnered two GRAMMY nominations in the Big Four in two consecutive years. The era ended rather abruptly over the summer as third single “You Need Me, I Don’t Need You” (followup to “Lego House”) was serviced as duet “Everything Has Changed” (with Taylor Swift, from Red) went to radio in July, with “Changed” winning out. Yet, times have changed again and he’s back for more. 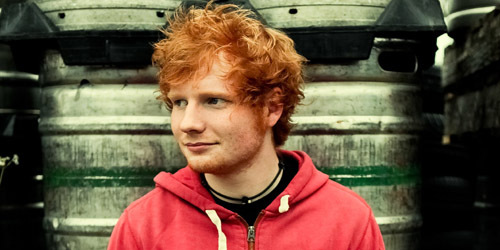 “Sing” leads off the second full-length album from Sheeran, x (“multiply”). It’s issued worldwide on Monday, June 23. It was produced by an unlikely collaborator, Pharrell Williams, who describes the song as “a dance record… not because it’s electronica, but because it’s danceable.” (Billboard) He’s certainly right. The massive track, built on a booming drum line straight out of the 80’s hip-hop scene, the singer’s charming falsetto and a guitar riff sounding plucked out of “Long Train Runnin'” by the Doobie Brothers, is bound to be a huge hit during the summer season and certainly give him the needed momentum to have a well deserved big sophomore era on the worldwide charts. Out on the town, Sheeran and his lady make their best of their crazy situation by “ignoring everybody here/We wish they would disappear/So, maybe we could get down now.” Intent to woo her more directly, he opines, “I want you to be mine, lady,” and into the stripped-back chorus, becomes decidedly more sensual: “If you love me, come on, get involved/Feel it rushing through you from your head to toe.” Their passion for one another grows rather quickly, as he quickly raps to open verse two: “This love is ablaze/I saw flames on the side of the stage/And the fire brigade comes in a couple of days.” The songs rides along in this zone for much of the rest of composition, grooving to a solid beat against Sheeran’s shouts of “Can you feel it?” much like a Jacksons disco record. It’s fresh, yet inspired, and it’s bound for a whole lot of attention. Look out for more information on Sheeran’s forthcoming album and tour dates in Europe (and hopefully the U.S. as well) on his official social media sites. Shortly before Halloween in 2010, I discovered a video from a newcomer that really caught my eye. In the clip, you could choose which direction you wanted it to continue in from a series of two options, a bit like the Goosebumps books I’d read as a kid. Well, it took a few months for the song behind it to finally be serviced to radio, but when it did, it became the first hit for a then 27-year-old singer named Andy Grammer, and what a ride it’s been for him since. With three singles ranking on the Hot AC chart, two making the Hot 100 and achieving Gold (“Fine By Me”) and Platinum (“Keep Your Head Up”) certification, and a solid album to boot, it’s been a great first few years for both Grammer and S-Curve Records, who signed him four years ago. Since third release “Miss Me” peaked, however, not much has been known about his second album. An EP from the singer, consisting of the live-tested “Crazy Beautiful” and “I Choose You”, made their debut in May, but neither saw much promotion besides a small appearance on The Bachelorette. 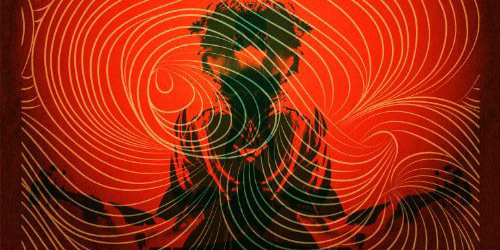 When I interviewed producer and songwriter Matt Radosevich in early December, he noted that he was involved in the sessions for the effort, but wasn’t sure when it would be out. Now, we have our first official taste of it in a new single called “Back Home”. This sentiment continues in a sing-along chorus, ending on the message that “we always find our way back home.” Into the second verse, the two friends reminisce about the memories of “cheap sunglasses/Red Bull and minivans/And people who had your back when the world didn’t understand.” Now that time has passed and their experiences have returned them to the place where they started, they two realize that despite the changes and much like they began their night, “we’ll still be raising our cups to the same damn things.” It’s a concrete story and one that I’m sure is relatable on more than one level to Grammer’s core audience. While many recent acts have cruised into that pop-folk crossover, this single, thankfully, does not sound as forced and should be enjoyed for what it is: a nice song with a positive vibe. Even though the material is worthy of being a hit and I’m sure his base will come out when the song is up for downloading, the radio situation is a little bit concerning at the moment. S-Curve doesn’t have as much pull at radio as it did a few years ago with acts like Duran Duran and We The Kings, mostly because the landscape of the formats have changed and so have the panels in terms of their ratios of large company stations versus independent ones. However, given that Grammer is one of their bigger artists at the moment, perhaps they’ll be able to build up their resources in order to deliver on giving him a proper leadoff to his second album. Look out for “Back Home” on a radio station playlist near you when it’s serviced later this week and be sure to support the latest project from Andy Grammer by downloading his new single when it hits digital retailers on Tuesday. He didn’t start the “Fire”. Burning onto the scene this week is the latest from singer-songwriter Phillip Phillips. “Raging Fire” is the first single from Phillips’s forthcoming second studio album, title TBA, which is due later this spring. It was written by Phillips himself and produced by Gregg Wattenberg, who also produced the major of the singer’s debut effort, The World From The Side Of The Moon. It goes to both digital services and radio today, and officially goes for AAA radio adds on the 17th. Look for the former American Idol winner to return to the show that crowned him back in 2012 with a live performance of the song on Thursday night. Won’t you turn my soul into a raging fire? 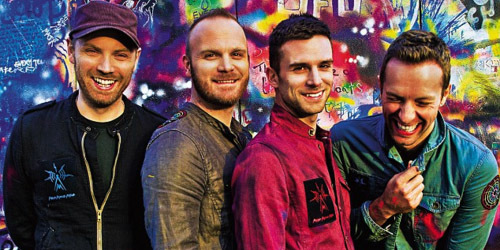 Last time Coldplay released an album was in 2011 with the great Mylo Xyloto, featuring hits like “Every Teardrop Is A Waterfall” and “Paradise”. Now, “Magic” becomes the first official single from Coldplay‘s forthcoming album, Ghost Stories, due in May. It follows the promotional track “Midnight”, which was released late last week. You can hear the song beginning at 9AM Eastern on the hour via your local Clear Channel Alternative format station.